Afternoon tea is all about relaxation, enjoyment, and taking time to refresh the spirit. Creating a daily tea ritual is one way to bring a little grace into modern life and sharing our tea ritual with others only doubles that grace. Everyone seems to be busy these days but how nice it is to stop the comings and goings now and then to spend time around the tea table with friends and family. This is a most simple but elegant way to entertain. 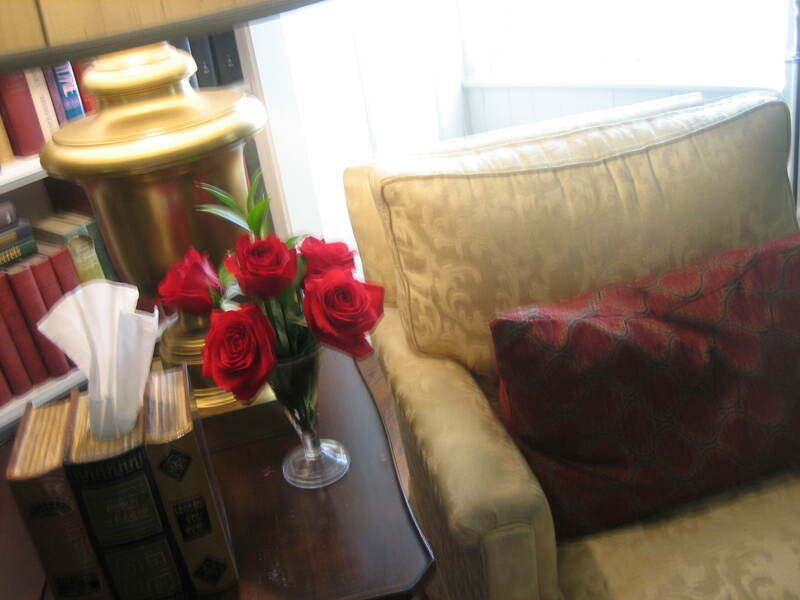 We have the telephone, e-mail, text messages and social media, but to sit across from our guests, listening and sharing in person… that’s special. 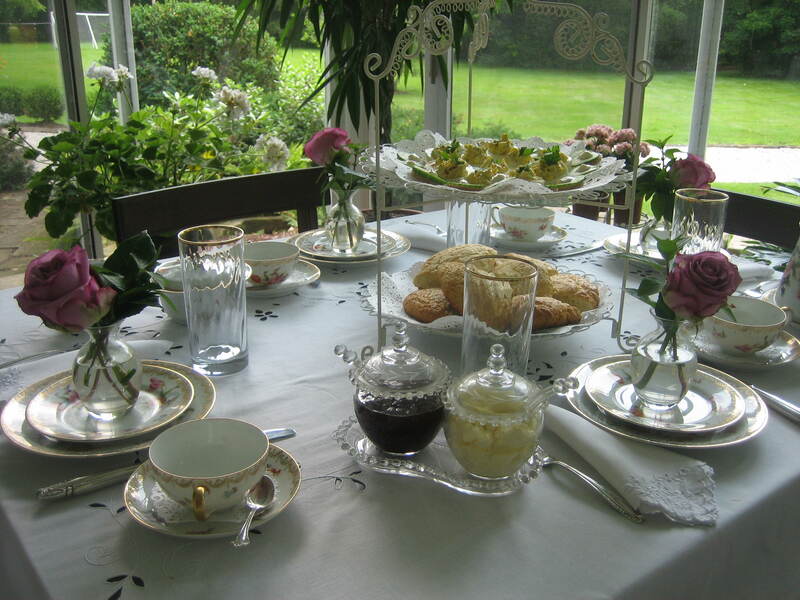 Hosting afternoon teas is one very nice way to celebrate the importance of relationships. And so today I’ve invited three dear friends to join me in my afternoon tea ritual. 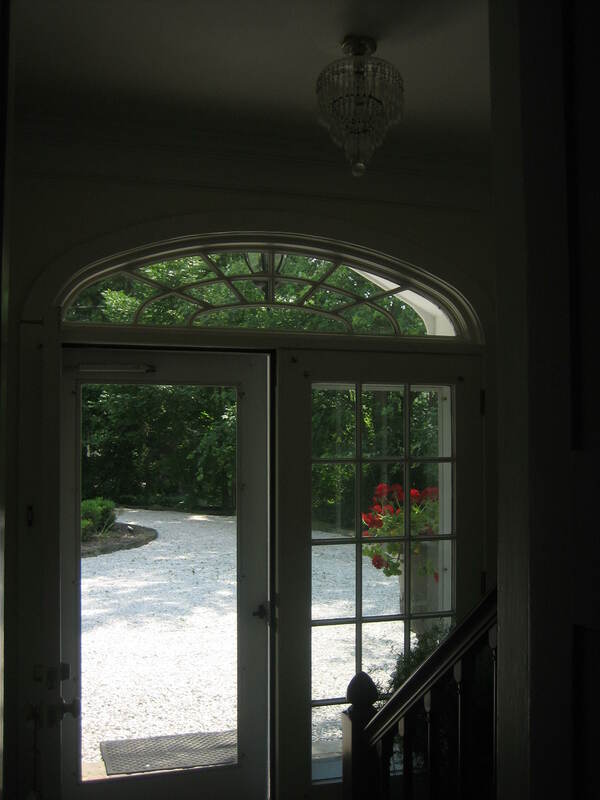 The door is open ready to receive my guests. We could be meeting at a tea establishment, but I think there’s something special about sharing tea in a home. After all, we work to make our homes cozy and comfortable. These efforts should not be for ourselves alone. Sharing our home doubles the joy our home gives us. Sharing anything and everything doubles the joy. Sharing in life is important. What have you shared lately? Each of my teas is served in a different setting. Creating these different sets in different rooms is a large part of my fun. 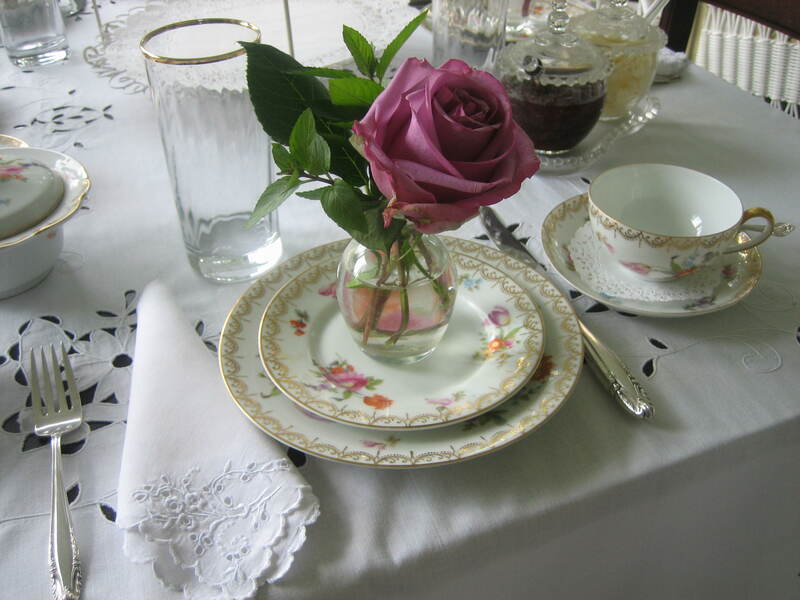 I choose different linen, different china, different flowers and at least one different food item at each tea. 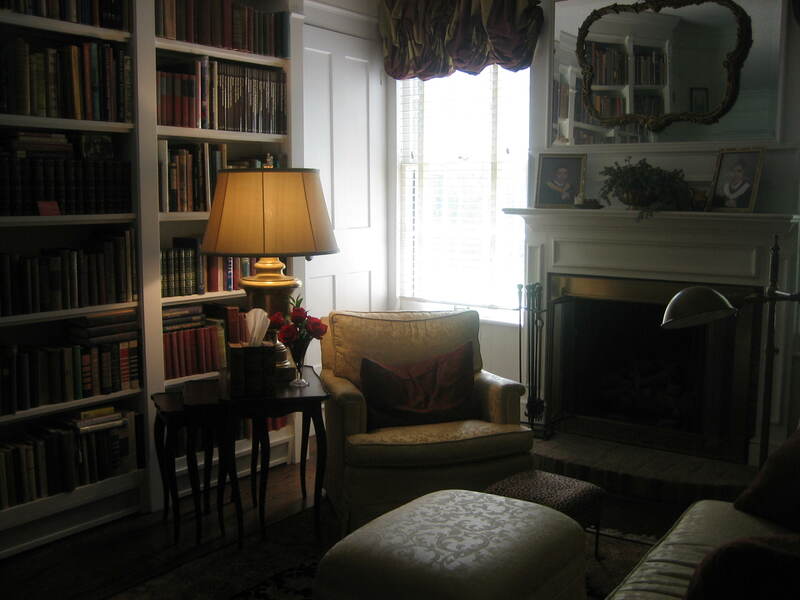 Today I’ll be serving on the porch, but as guests arrive, one by one, we’ll gather in the library, then go out to the porch all together. 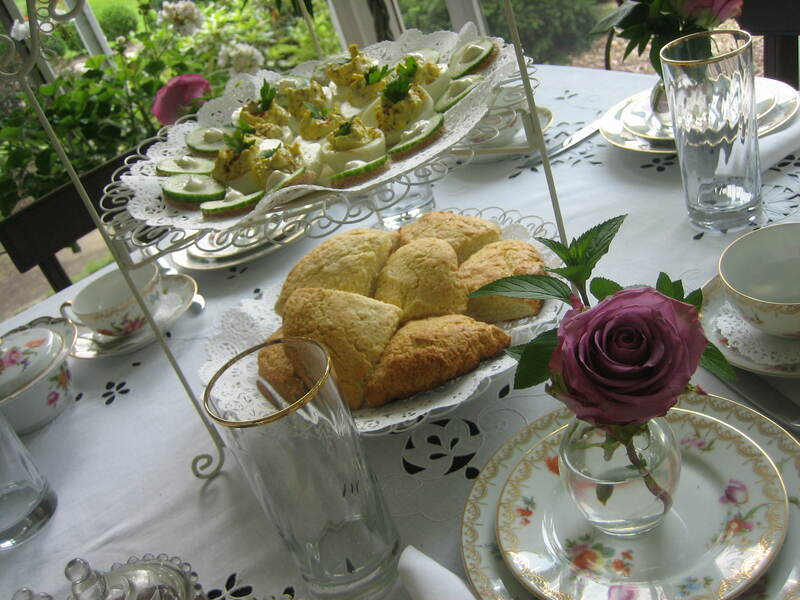 An afternoon tea party is a little like a theatrical presentation. Having details in place and a plan of action helps to make things run smoothly. Also it’s nice to have pretty things for your guests to enjoy – music, fresh flowers here and there, fragrance… These and other little niceties may not be necessary but they will delight your guests and make their visit more enjoyable. 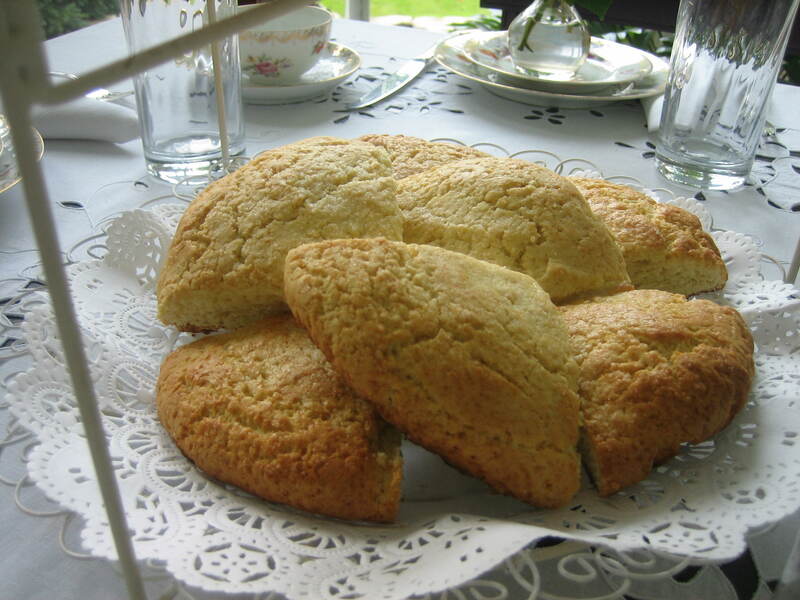 Earlier in the day I made scones, my basic recipe. Over the years I’ve learned it’s not important that the food served be elaborate or very plentiful, just that there’s something to nibble on. The most important thing at tea is the tea itself and the sparkle of joyful eyes as they share, listen, laugh and enjoy each other. 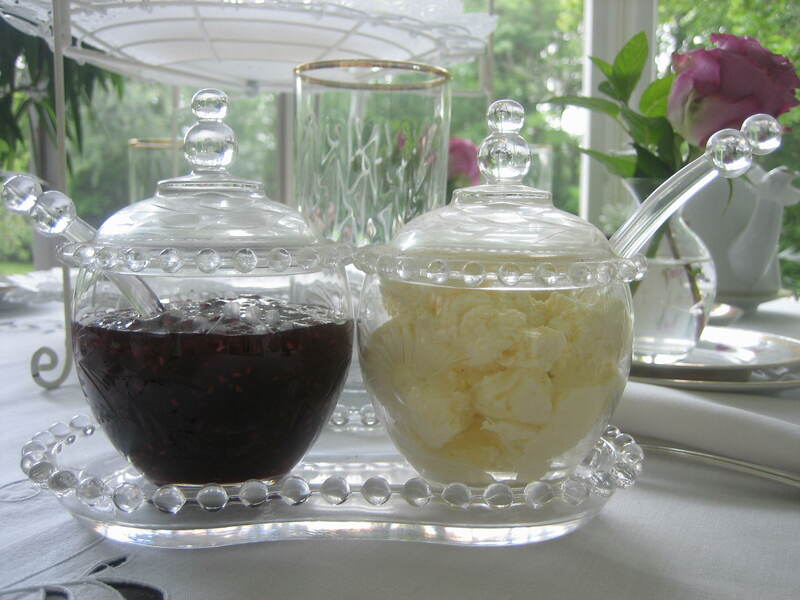 Raspberry preserves and clotted cream are a perfect accompaniment to the scones and really all the food one would need for afternoon tea is not only about the food. It’s about the sharing and relaxing together. Simple and easy does it. But if you do enjoy cooking and baking the sky is the limit. with Lemon-Pepper Aioli to today’s tea menu. Something old, something new. The ingredients for the eggs are: 6 hard-boiled eggs, 3 tablespoons mayonnaise, 2 tablespoons prepared yellow mustard, 1 tablespoon very finely chopped celery, 1 tablespoon very finely minced capers, 1/8th teaspoon salt and a garnish of parsley. The aioli is made by combining 1/4 cup of mayonnaise, 1 teaspoon of fresh lemon juice, 1/8th teaspoon of pepper with 1/8th teaspoon of salt. This aioli is piped atop a thin slice of English cucumber which sits on a thin slice of white bread. 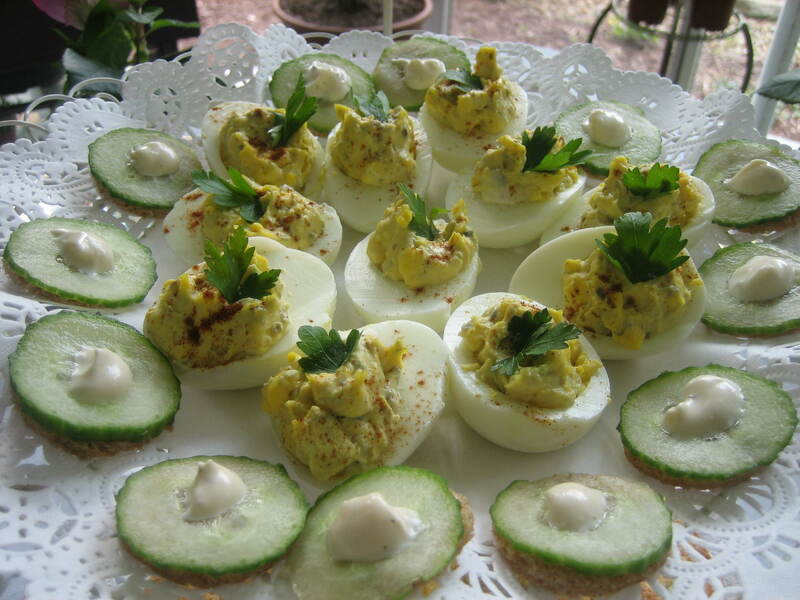 Scones, deviled eggs, cucumber slices, simple items, quick and easy to make, but pretty finger foods to present at table. And though the food is simple I try to make the place settings special by adding flowers. Simple but lovely, flowers create magic with their beauty and grace. Of course if you love to collect pretty things as I do now is the time to use the embroidered linen napkins, the silver, the cutwork tablecloth and the antique china. These things shouldn’t be collecting dust in the cabinets. They should be used and enjoyed regularly. Without very much work at all the table is ready to receive my guests. And here they are. 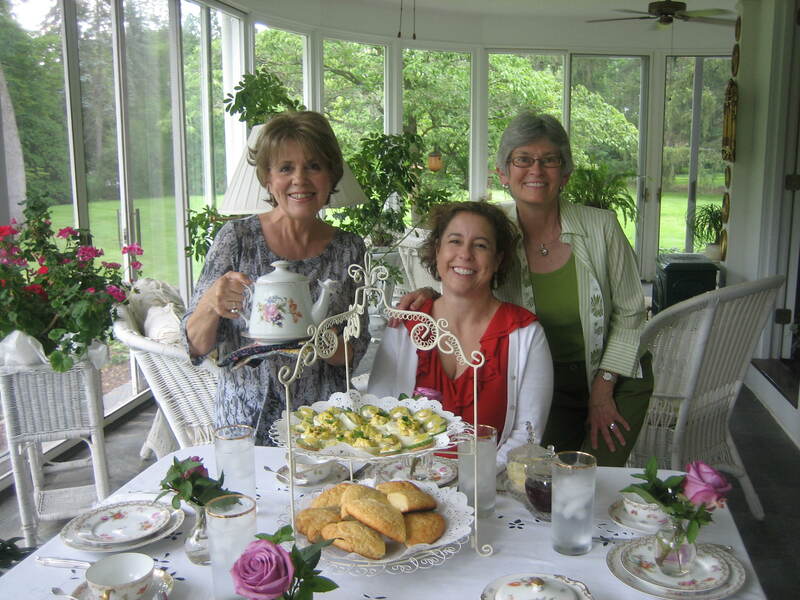 Terri, Carol and Joni, three lovely ladies who make my day and my tea a very enjoyable experience. 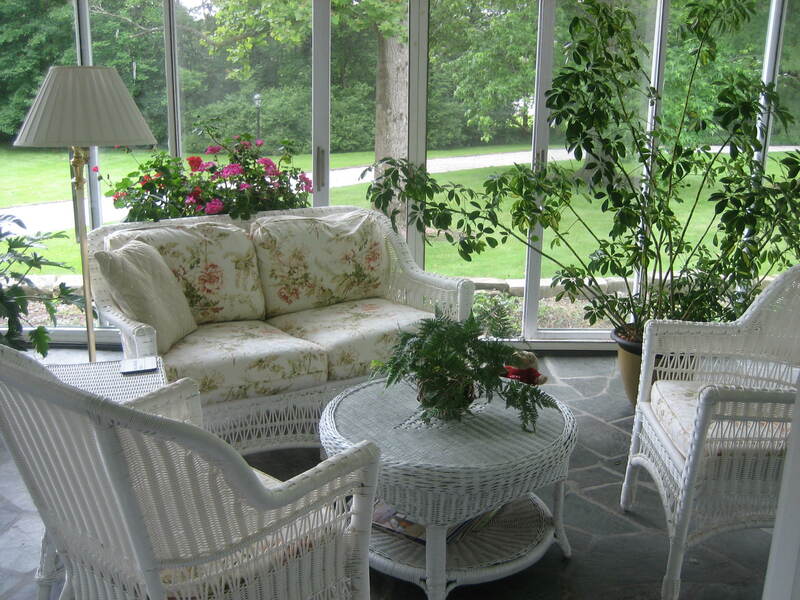 The porch got a going over before the girls arrived… a little dusting and polishing. Cleaning is never my idea of great fun, but when company is coming I have a good reason to do that cleaning and then not only is the house nice and shiny for the company, it’s also nice and shiny for me and my husband. So I encourage you to host your own afternoon tea. You may think tea parties are a thing of the past, but you’re wrong. There’s something about an afternoon tea that makes it seem just right for us now. It’s a complete treat – a physical pleasure. 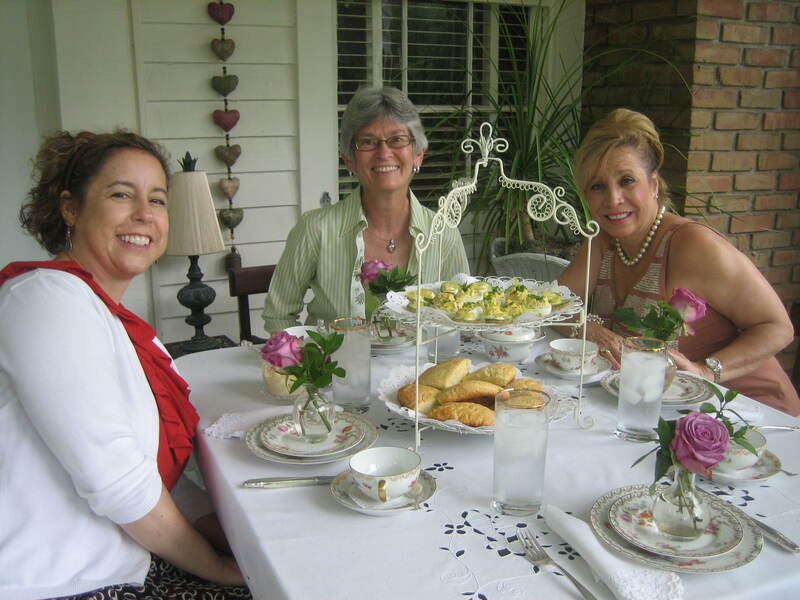 a social gathering, a chance for intellectual exchange and a spiritual experience for we’re sharing plenty of spirit at tea. Most of all the afternoon tea experience enriches everyday life by gilding the moment with importance. It celebrates life in a most genteel way. When your tea is over you’ll sit back on your porch remembering all the fun you had and you’ll feel a sense of satisfaction knowing that you and your creativity brought people together sharing joy. Only you can loosen your day’s demands. I’ve only ever had a full afternoon tea at a special tea (hehe) shop, and always wondered if having it at home would be better. 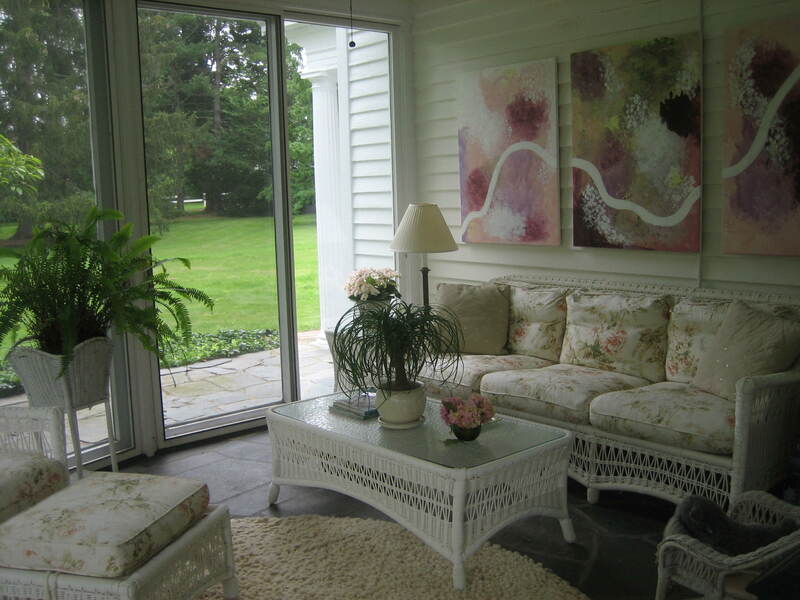 This post swayed me completely – it looks so lovely, and so much more relaxing! I hope I can convince my friends to give this a go sometime. Thank you for the inspiration. Dear Meg, So nice to hear from you. I’m delighted I’ve inspired you to host your own tea. I know you and your guests will have a lot of fun. Tea shops are nice, but at home teas are a different kind of nice. Why either/or when you can have both/and. Let me know how it goes. I was very impressed with your tea time in your home and the activities involved. You make possible an extraordinarily special—and rare—little niche in this hectic world, Carol Ann, and I’m sure that it requires much work and planning on your part. Greg, I’m pleased you liked my teatime efforts. I truly have a lot of fun creating the life I imagine and then sharing it with others. It’s not work. It’s play. Would you enjoy coming to tea? I do have men guests from time to time. Reading your letters to me actually gives me a sense of having tea with you. No Greg, I didn’t mean for you to drive on over to Ohio for the pleasure of one of my teas… though of course you’d be welcome. I wondered if the idea of afternoon tea appealed to you at all. Of course. I think that conversing with you in any venue would be great. Who would not delight in being a guest at one of your afternoon teas? it must be a lot of fun to create them utilizing different ambiances in your home and garden, deciding what to serve and choosing the table setting. I went to a tea house once where the first thing you did was choose a fancy hat and scarf to “dress’ in. That added to the fun. I’m sure there is not a more gracious hostess than you. It’s wonderful that you’re keeping the tradition of “afternoon tea” alive and inspiring others to do the same. Let’s see. 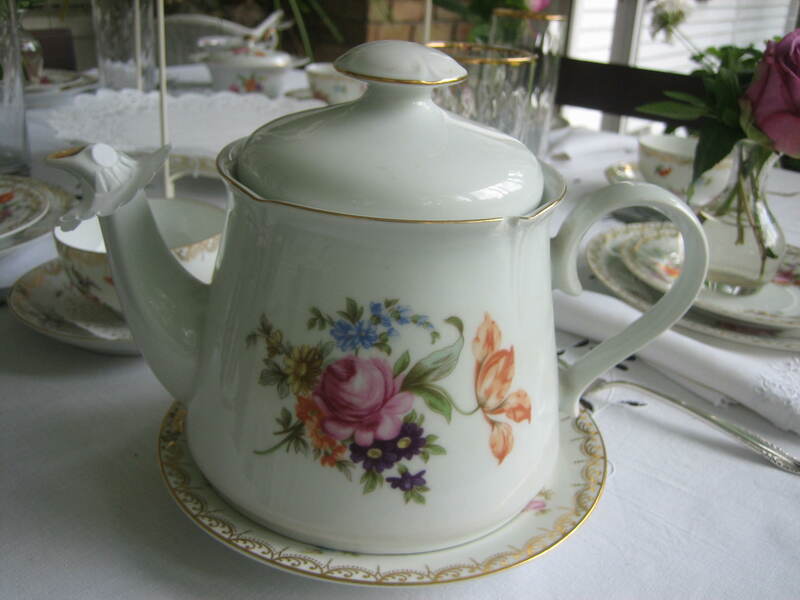 In about an hour it will be 4 p.m. here and I shall have a cup of tea in your honor! Almita you are too too kind. I’m so glad you approve of my afternoon teas and my sharing of them in posts. I truly wish the idea would catch on for I love not only hosting teas but also being invited to them and that doesn’t happen nearly often enough. Boo hoo. Today I’ll be planning my next tea which will happen the day after tomorrow. I wish you could be one of my guests for your presence would add a lovely note, but since you’re so far away, yes think of me at your tea times and I’ll think of you at mine.